Key features of Soothe & Gain. . . Soothe & Gain is a high calorie, low starch and low sugar soaked feed, suitable for horses prone to gastric ulcers. With a high calorie/energy level it is ideal for those in harder work and those that need to put on or maintain weight and condition. The energy that Soothe & Gain supplies is from fibre and oil, providing an excellent source of slow release, stamina-giving energy. Being whole cereal grain free and molasses free it is low in starch and low sugar, ideal for those that react negatively to high starch diets. The fibre sources in Soothe & Gain are also high in Beta-Glucans. Soothe & Gain contains antacids, a probiotic and a blend of prebiotics to help support healthy digestion. Fully balanced with vitamins and minerals, and containing a careful selection of herbs: mint, nettle, dandelion and fenugreek for their well-known properties and ensuring Soothe & Gain is highly palatable. DO NOT FEED DRY –THIS PRODUCT CONTAINS UNMOLASSED SUGAR BEET AND MUST BE SOAKED FOR 5 MINUTES BEFORE FEEDING. Introduce a new feed gradually over 7 to 10 days building up to the amounts needed to maintain condition and energy levels (0.25 – 5.0kg depending on size, type, workload and condition). Place feed in a shallow bucket, add twice as much water as feed, then stir. Wait 5 minutes before feeding this product. IMPORTANT, PLEASE READ: THIS PRODUCT DOES NOT PREVENT, TREAT OR CURE GASTRIC ULCERS. IF YOU SUSPECT YOUR HORSE HAS ULCERS PLEASE CONSULT YOUR VET. To get the best results from Soothe & Gain, please make sure that you do not feed any other products that contain barley or molasses, as these ingredients can cause feed intolerance or behavioural problems. 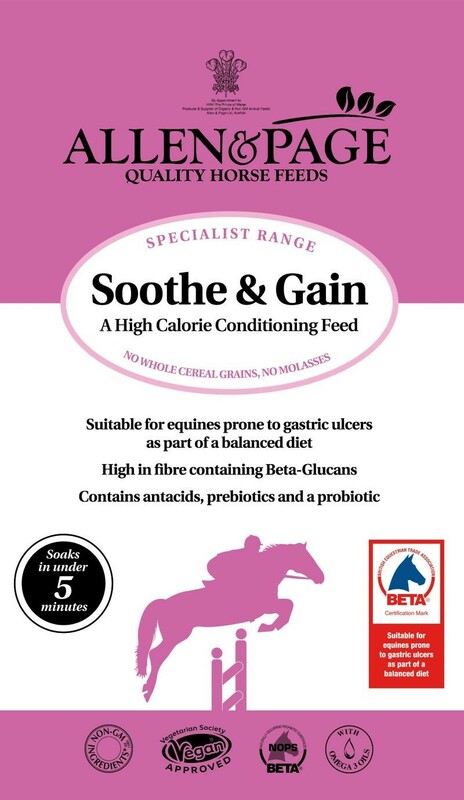 This feed is not suitable for horses and ponies prone to laminitis as it is over 10% combined starch and sugar. Please call our Nutrition Team for advice on a suitable feed.